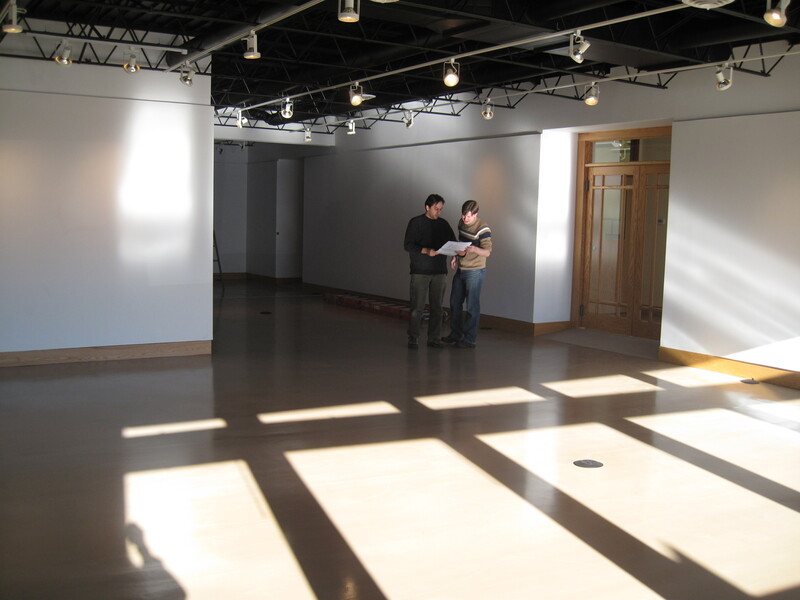 Architect Sam Olbekson and NACDI's Andy Hestness in the new AMR Gallery. Photo by Sheila Regan. All My Relations Arts (AMR) opens the doors of its new gallery space on January 21 after a fast-paced 11 months of the American Indian community pulling together to make it happen. The opening exhibition, called Frank Big Bear Paintings: From the Rez to the Hood to the Lake, marks the start for AMR after it left Ancient Traders Gallery (run by Great Neighborhoods) in 2009. The new gallery, which will feature contemporary fine art by American Indian artists, is located at the former Open Arms space at 1414 Franklin Avene East in Minneapolis. The one story brick building will house the gallery as well as a coffee shop owned by Robert Rice (White Earth Ojibwe) who also co-owns the 42nd Street Station in North Minneapolis. The coffee shop will contain a community wall, for youth and community art projects, as well as an electronic flat screen monitor, which will provide an interactive catalogue of information about Dakota Lands facilitated by the Indian Land Tenure Foundation. In addition, the building will house the offices of the Native American Community Development Institute (NACDI) and the offices of the American Indian Community Development Corporation (AICDC) (who jointly own the building). The building will also have a community meeting space. Last February, AMR became an official initiative of NACDI, an organization focused on community development as part of NACDI’s goal to develop the American Indian Cultural Corridor, which runs along Franklin Avenue between Cedar and 11th Avenue, building alliances among American Indian businesses and organizations to improve the economic and cultural vitality of neighborhood. According to Heid Erdrich, there has been incredible support from the arts community and the American Indian community to make the gallery happen. Last spring, volunteers gave their time to make phone calls raising money for the Friend Raiser for the Arts, which raised $8,600 in about a month from 70 individual donors. In addition, The McKnight Foundation donated $75,000 toward securing the space plus an additional $150,000 toward building out office space for NACDI, as well as the gallery. The Minneapolis Foundation contributed another $10,000 toward the project. The architect for the project is Sam Olbekson (White Earth Ojibwe) who grew up in the Phillips and Powderhorn neighborhoods. He is a graduate of Cornell University, where he received a Bachelor of Architecture, and Harvard University, where he received a Master of Architecture in Urban Design. Olbekson offered his design services on a pro bono basis in order to contribute personally to the revitalization of the neighborhood and to “help give the project an additional layer of Native authorship,” said Olbekson. The building’s interior has been completely redesigned, and the exterior improvements include a new main entry area and canopy painted with the colors of AMR’s logo created by Buffalo Nickel Creative, a Native design group. Outside of the gallery sits a sculpture by artist Gordon Van Wert (Red Lake Ojibwe) that was installed in October 2010. Eventually there will be seating areas and gathering spaces outside, according to Olbekson. NACDI has also recently been awarded a $10,000 grant from The Metropolitan Regional Arts Council (MRAC) for signage for the building. Construction of the new space included work by MAG Mechanical, a Native owned business, and Migizi Electric which has an all-Native crew. Painting was done by a Native American Division of Superpainters, who painted the exterior of the building and the interior ceiling. In addition, volunteers from PCL Construction crews donated their time for the project, according to NACDI’s Community Development Specialist Andrew Hestness. Following the Frank Big Bear show, Erdrich said the gallery plans on having a new exhibit each season, eventually hosting ten shows a year. Frank Big Bear Paintings: From the Rez to the Hood to the Lake runs from January 21 to February 28 at All My Relations Gallery at 1414 East Franklin Avenue. Hours are Tuesday- Friday 11-6 p.m. and Weekends 11-3 p.m. The opening reception takes place on January 21 from 5-9 p.m.